Governor Yuriko Koike of Tokyo: Tell Sister City, Seoul, South Korea, That We’re Opposed to the Torture and Consumption of Dogs and Cats. Seoul became sister city with Tokyo in 1988. 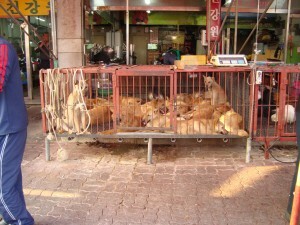 Yet Seoul, South Korea is responsible for the ongoing horrendous torture and killing of dogs and cats. Korean TV news about Seoul Gyeongdong Dog Meat Market: http://koreandogs.org/street-horror-dog-slaughterhouses-heart-seoul/ Based on a recent news article, “South Korea’s dog meat clash“, there are 8 slaughterhouses around Cheongnyangri residential area near Gyeongdong market alone. Please sign petition, call and email Tokyo Governor Yuriko Koike, TODAY! No matter where you live, please SIGN OUR PETITION. CLICK HERE to send an online message to the Governor Yuriko Koike. No matter where you live PLEASE SHARE these actions with your friends – especially those who live in Tokyo! I sent a letter and sign petition!